Our love story is a series. Click here to read parts 1-6. In December of 2011, Miguel and I graduated from Florida State University. Miguel's degree is in Biology, and mine is in Editing, Writing, and Media. Graduation was a big deal. It was scary and exciting at the same time. Exciting because all our hard work had finally paid off. We had our degrees and were ready to go out into the world. But it was scary because we would be embarking on this new journey separately. Miguel had a job lined up in Orlando. He was going to work for Disney as a Conservation Education Professional Intern. I didn't have anything lined up, so the plan for me was to move home to Houston and apply to jobs in Orlando until I got one. Though as I'm writing this, I'm sitting here trying to figure out how anyone thought that made sense? Who knows? All I knew was that Miguel and I were about to be long-distance again, and I was terrified. After two weeks home in Houston, I got an interview in Orlando. My father and I drove to Florida for the interview. While on the way, I got the call for an interview for a different job. Turns out, I got the first job on the spot. So, I packed everything back up and moved to Orlando. Two weeks after Miguel. Really, who thought any of this made sense!? Anyway, long story short, I ended up living and working in Orlando about a month after graduation, living in the same apartment complex as Miguel. We lived in Orlando for one year. Early on in that time, we started going to Celebration Community Church. While there, we made some very dear friends who are like family to us today. Miguel also made good friends during his time at Disney that we are still very close with (and who I have been fortunate enough to photograph!). It still shocks me to my core that this all happened SIX years ago. HOW!? In January of 2013, Miguel's time at Disney came to an end. And we still weren't engaged. Miguel got a job at The Houston Zoo, and we moved back to Texas. Our Love Story is a series. Click here to see parts 1-5. Us on the beach at Miguel's parent's condo. Ah, our time at FSU. It was here that we really grew up together. When we started dating, we were teenagers. Just 18 years old. When we graduated from college in December of 2011, we were 21 and about to start "real" jobs and be "real" adults. Truth be told, nothing terribly interesting happened between 18 and 21. There was some drama, as can be expected, with Miguel's ex, but nothing too serious looking back. On our first anniversary, Miguel gave me a beautiful promise ring. I'm slightly obsessed with hearts, as he knew, and so the ring had 3 hearts on it. I promptly lost it three months later on a trip to Disney World. The fact that he wasn't upset with me for even a second should tell you all you need to know about how awesome he is. I, however, am STILL upset. I wish I still had that ring, but at least that was no omen for how our relationship would work out. Honestly, nothing really interesting happened for us at FSU. We went to a lot of football games. We made some good friends. We graduated! In January of our Junior year, we adopted a mini dachshund puppy named Dash. Quite a few of our friends who were in serious relationships ended up getting engaged just before their last semester in college. I thought we would be the same. Spoiler alert: we weren't. On our second anniversary, I thought he might propose. On our third, I was sure he would. He didn't. But I wouldn't change it for the world. After graduation, we moved to Orlando, Florida. In my head, that's where our life together really began. Our Love Story is a series. Click here to see the other parts. September 2009. Miguel and I had been dating for just about 3 and a half months. I was living in Manhattan, attending New York University. Miguel lived in Tallahassee and was a student at Florida State University (GO NOLES!) I'm going to be real for a second. Long distance relationships are TOUGH. I know I wasn't prepared for it. We talked on the phone and texted back and forth all the time. We used Skype when we could. One weekend in October, I went up to the mountains in Vermont with a group of friends and had no cell service. I was miserable the whole time because I couldn't communicate with Miguel. Looking back, I may have been a little over-dramatic. I flew down to Tallahassee to visit him in late October, about a week after Vermont. I remember waiting outside of the airport with the words "gray Honda Civic, Texas plates, light spot on the side" playing over and over in my head as I desperately scanned the cars in the pickup line. When I finally saw him, it was like every cliche movie airport pickup scene. I ran into his arms as fast as I could and nearly knocked him over in the process. I knew that his arms was where I was meant to be. I had already been having a hard time up in New York the school year before and was looking at transferring to the University of Texas. Most of my friends had gone there, and it is a great school. I also looked at Florida State because I had been raised a Seminole, and it was less expensive to go to FSU as an out-of-state student than UT as an in-state. 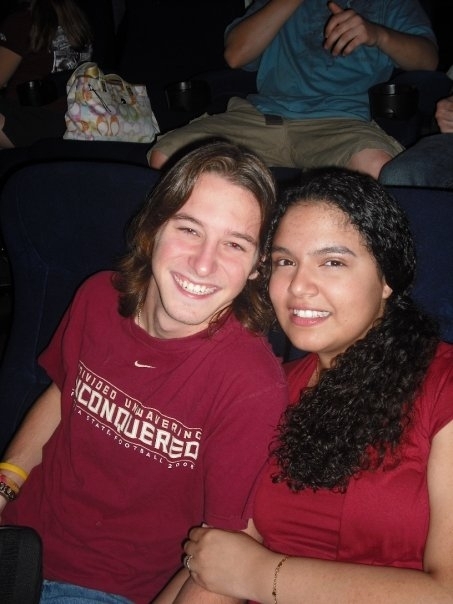 But when I started dating Miguel, it bugged me to think that people might accuse me of transferring to FSU just for him. So, I did the worst thing I've ever done: I considered UF. Eventually, I came to my senses and applied to transfer to Florida State University for the upcoming Spring semester. I moved to Tallahassee in January of 2010, and Miguel and I haven't spent more than a few days apart since. An early photo of us on a cruise in 2010. This is Part 4 in a series. See the rest of the series here. So remember how I said we charged a mutual friend with Keep Miguel & Amanda Platonic Duty? Yeah...she didn't do a great job. Maggie, if you're reading this, THANK YOU! Thank you for secretly plotting to get us together. On May 16, 2009, five days into Summer Vacation, five days into Miguel and I being in the same town again, the THREE of us went on a road trip from Houston to Austin, Texas. We had purchased tickets to see a Broadway Across America production of RENT (one of my all-time favorite shows!). When we arrived at the theater and went to take our seats, Maggie did what she had been told to do. She took the middle seat between Miguel and I. Miguel looked her in the eyes and said, "Please move." Half way through Act Two, we were holding hands. The hand holding continued for the entire drive home while Maggie sat smugly in the backseat. There was no turning back. Two days later, Miguel officially asked me to be in girlfriend. How could I say no? Here was this man I'd been crushing on for months, the first guy EVER to reciprocate feelings toward me. I was on Cloud 9. Three days into our relationship, Miguel told me he loved me. It was the greatest feeling in the world. The rest of that summer flew by far too quickly. We spent all day every day together, from noon to midnight (when neither of us was working). We watched countless movies, met each other's families, and hung out with friends. As the end of the summer drew near, Carrie Underwood's The Night Before Life Goes On became my heartbreak anthem. Miguel and I would be returning to different schools in the Fall, and at that point we would become long distance. A photo of us at the midnight showing of Harry Potter and The Half Blood Prince. We were such babies! This is part three in a series. See parts one and two here. After that fateful day in January of 2009, Miguel and I were in constant contact with each other. It was like we picked up our friendship right where we had left off at graduation. By March, I was smitten. Miguel was at Florida State University, and I was at New York University. Our Spring Breaks were over two separate weeks with only a weekend overlap between them. For that weekend we were both back home in Houston, we spent the whole time together "as friends." The rest of the semester passed painfully slowly. I spent most of it wishing it was summer break to be able to see Miguel again, even though we were determined to remain "just friends." Then one night we stayed up all night talking on Skype. We spent hours finally admitting to each other what we had known all along: that there were feelings there. But here's the real kicker. We STILL vowed to remain just friends. The truth was that at this point, it was still only a few months since he and his high school girlfriend had broken up. Our desire to keep things as platonic as possible came out of a respect for her and her feelings. But it was hard. So hard to like someone and have them like you in return knowing that there was nothing you could do about it. It was easier in a way that we were 1000 miles apart in different states, but summer break was approaching and we'd be back in the same town again. We had a mutual friend from high school that we charged with Keep Miguel and Amanda Platonic Duty. We made sure she was with us at all times because we didn't trust ourselves to be alone together. She didn't do a very good job.